When things don't make much sense, it pays to distance oneself emotionally from the present for a while, and draw lessons from history. We seem to be in the midst of such confusing times, right now. The list of unknowns that affect markets and stocks is huge. No one knows what lies ahead for these variables in the near, or even distant future. But, if only you could turn the clock back, you would see, quite reassuringly, that none of this is new. The markets have seen them all, and every downcycle has been succeeded by gravity-defying gains...more so in the small cap space than any other. Let's dig a little deeper. Think of the first time you bought a stock. How did it feel? Did you get lucky? I don't know what your respective answers will be to these questions... But I'm guessing your first stock was likely a speculative bet. Why do I say this? Because it's very unlikely that someone buying their first stock will know how to analyse a business. When I bought my first stocks in the early 2000s (ITC and Cipla), I was not working with Equitymaster, and I had no idea why I bought them. You've probably heard the saying that every storm is preceded by a period of lull where things are calm and there's not much noise or activity. The same can be said of the stock market as well. And the best way to take advantage of that lull is to buy up solid companies selling for cheap, so that one could potentially make substantial profits from them later. Our Hidden Treasure service has now got over 20 stocks you could consider buying during this lull period. Something like this hardly ever happens, so don't let this opportunity go. Click here to join Hidden Treasure at 50% off now! I just saw that these stocks going up...and had a hunch that they could go up more! By sheer luck, I made some short-term profits. Yeah. Most people go through this. It's quite normal, actually. Over time, we gain knowledge and experience. Our stock-picking skills improve. We learn to separate the stock from the business. We learn to ask the right questions. But did you know that you don't have to struggle to find the answer to that question? Warren Buffett has already done the work for us. No kidding. In his 2007 letter to shareholders, he explained the three types of businesses: the great, the good, and the gruesome. Great businesses are easy to understand. They earn huge returns on capital. They grow at a steady pace. They don't need much capital to grow. They pay out large dividends. They're tough to compete with. Their stocks almost never trade cheap. You would love to buy them, but their valuations usually don't allow it. Gruesome businesses are also easy to understand. They earn low return on capital. They grow at a fast pace. But they need lots of capital to keep growing. They can't pay out much dividends. They're not difficult to compete with. Usually, they are already competing with many others like them. Gruesome businesses are a dime a dozen. Their stocks regularly trade cheap. But it's best to avoid them. They can turn into value traps. Now comes the tricky part: The good business. Good businesses are neither here nor there. They have some sort of competitive advantage; but not a lot, and it's certainly not obvious. They face high competition. They may or may not grow fast. A lot depends on how fast their industry is growing. They need regular amounts of capital to grow. Dividends are uncertain. The stock markets are filled with good businesses. But they don't always trade cheap. So what do we do when we find one that is? Wait! Don't jump in just yet. What are the margins? Can they improve? How is the industry doing? Where does the company stand in the pecking order? And most importantly, is the management team good? This is not an exhaustive list. But get this right, wait for the right price to buy and stay patient...And you will be ahead of most people. It's at times like these when the market is witnessing correction, babies are being thrown out with the bath water. This gives shrewd investors a great buying opportunity. I see one such brilliant but overlooked opportunity in my recent Hidden Treasure recommendation. Operating in the logistics space, this company was set up by a first generation enterpreneur. Starting with a team of just eight people, the company has grown into a force to reckon with, with employee strength of over 300. The current market crash is indeed a cause of concern for most investors. But if you're an opportunist, it could be a blessing in disguise. 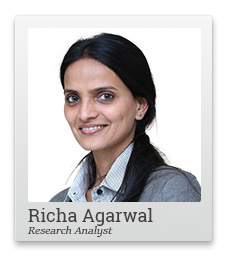 Tanushree Banerjee, our Safe-Stocks Expert, has carefully picked 7 Blue chip stocks for her loyal subscribers and they're now available at bargain prices. But these stocks may not be available at such attractive valuations for long. 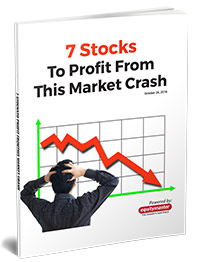 So before it's too late, click here to claim our special report on 7 stocks To Profit From This Market Crash. The company has grown its topline and bottomline at 22% and 27% CAGR (compound annual growth rate) respectively over the last five years. Meanwhile, the return on capital and equity have expanded to18% and 19% respectively in FY18. And the debt on the balance sheet is completely within acceptable limits (0.4 times in FY18). The business has been able to achieve this growth because of its asset light nature. While one does not need too much fixed capital to be in this business, entry barriers remain high due to low single digit margins and high working capital. Most importantly, a strong network of contacts with clients and tie-ups with shipping lines and transporters...give this company one of its greatest strengths. At 16% correction from my recommendation price, it's well within the buying zone. In fact, as I write this, there are over 20 high potential small cap stocks you could consider buying now. I'll share more about these opportunities in forthcoming issues of the letter. But until then - don't let this opportunity go. You will realise that the current correction could be the best money making phase for long term investors in the current decade. PS: Over 20 small cap stocks available at the right price as I write this - history may not repeat this enormous opportunity again. What are you waiting for? Get greedy now. Get your recommendations now. Equitymaster requests your view! Post a comment on "Get this Small Cap Logistics Company at a 16% Discount Right Now...". Click here!